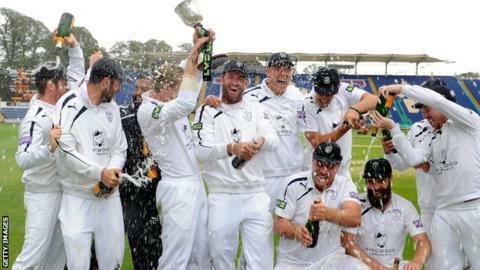 Hampshire bowler James Tomlinson paid tribute to his side after helping them seal promotion and the County Championship Division Two title. Tomlinson took season-best figures of 6-48 as Hampshire beat Glamorgan to seal their return to Division One. "It feels amazing," Tomlinson, 32, told BBC Radio Solent. "A remarkable effort. "We were confident a month ago but then Essex went on a blitz. To hold back a team that's won six out of the last seven is remarkable." He added: "To win three out of four under that pressure is a brilliant effort." Tomlinson admitted his wicket haul came as a surprise but said he was "over the moon" to have contributed to their victory in Cardiff. "It's an interesting wicket here and you are always in the game," he said. "I can't put my finger on it. Sometimes I think, 'what's it all about?' and I don't know. I was nervous, I didn't see this coming. "I really charged in today and hit a length. There is always life in this wicket and you have to be world class to bat on it." Like Tomlinson, Hampshire captain Jimmy Adams was part of the side that was relegated in 2011 and he described their achievement over the past season as "exceptional". Adams said: "It's a bit surreal. The guys have worked really hard throughout the year, we've played tough cricket and it is a great effort. The boys have been exceptional." Hampshire, who also reached T20 Blast Finals Day, had slumped to 53-5 on day one but rallied to defeat the Welsh side inside three days. "When we were 53-5 on the first morning there were serious doubts, but we have found ways of digging ourselves out of holes and getting crucial draws," he added. "Kyle Abbott was a huge part of that early effort but everyone has chipped in. It's been three years of hard work and it's nice to be back and get a taste of Division One cricket. It's a brilliant feeling."